The San Diego County Credit Union has announced it donated nearly $303,000 worth of school supplies to 61 school districts and charter schools in the region. The donations were part of SDCCU’s fourth annual Stuff the Bus campaign. The company partnered with the San Diego County Office of Education and four local iHeartMedia radio stations to hand out nearly 6,000 backpacks and 230,000 school supplies to students experiencing homelessness in 40 school districts and 21 charter schools across the county. “We are so pleased with the outpouring of support from the community this year. Once again the quality and quantity of supplies collected from the Stuff the Bus campaign exceeded our expectations,” said Michelle Lustig, the county’s director of Foster Youth Coordinating Services and Homeless Education Services. The county estimates the number of homeless school-age children in San Diego during the 2017-18 school year to be more than 22,000 — 2,000 higher than its estimate during the 2012-2013 school year. 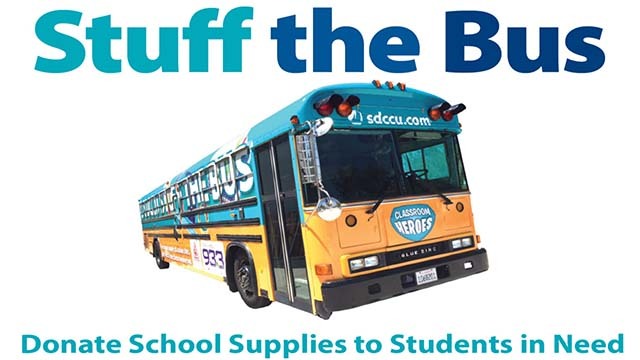 SDCCU, the Office of Education and iHeartMedia launched the Stuff the Bus campaign in support of the county’s Live Well San Diego initiative, which aims to improve the health and safety of San Diego’s communities through nonprofit and volunteer work.